Developments in digital technologies--and in understandings of how best to use them--have altered teaching and learning environments, and stand to do so even more rapidly in the future. Virtual Decisions: Digital Simulations for Teaching Reasoning in the Social Sciences and Humanities focuses on the special issues related to the use of digital technologies in teaching the complex nature of social decisions, with particular attention to the use of digital role-play simulations as a means to accomplish this. With the advent of new technologies for delivering multimedia simulations to students, and advanced graphics capabilities to create life-like decision environments, digital role-play simulations are increasingly available for K-12 and higher education teachers to use in the classroom. This book helps both users and developers make intelligent choices about the value added by using simulations, technology, and media to teach reasoning in social sciences and humanities classrooms. The book relies on a four-part framework for developing a digital multimedia-based simulation approach, which represents: a cross-disciplinary method to describing simulations; the students who are using them; the educational setting in which they are used; and a rubric for assessing learning. The volume is divided into two parts. The first part presents a review of the theory and research detailing why didactic approaches do not or cannot address specific learning goals, as well as a description of the theoretical framework for using and developing simulations. The second part includes chapters on specific digital simulations and how they fit with the theoretical framework. 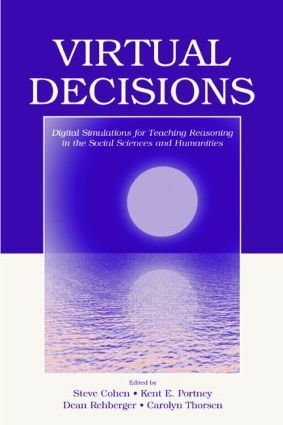 Virtual Decisions fills a significant gap in the existing literature of instructional technology and is of interest to instructors, primarily in the social sciences and humanities, who are potential users of the simulations. It is also a resource for graduate students and pre-service teachers studying simulation design.